New Zealand – the extreme sports capital of the world where adrenaline sports and fitness pumps through the blood of the nation and people live life in the fast lane. Unfortunately for some, that fast lane can lead to fast-food, excessive drinking and an unhealthy lifestyle. A product of his surroundings, 39 year old Derek Jones from Auckland knows just how easy it is fall into the trap of a fast paced lifestyle. 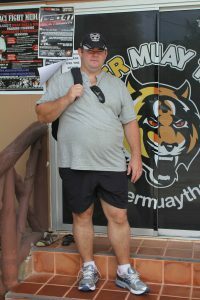 When car yard operations manager Derek arrived at Tiger Muay Thai & MMA Phuket in March 2011, he weighed in at hefty 165 kg. 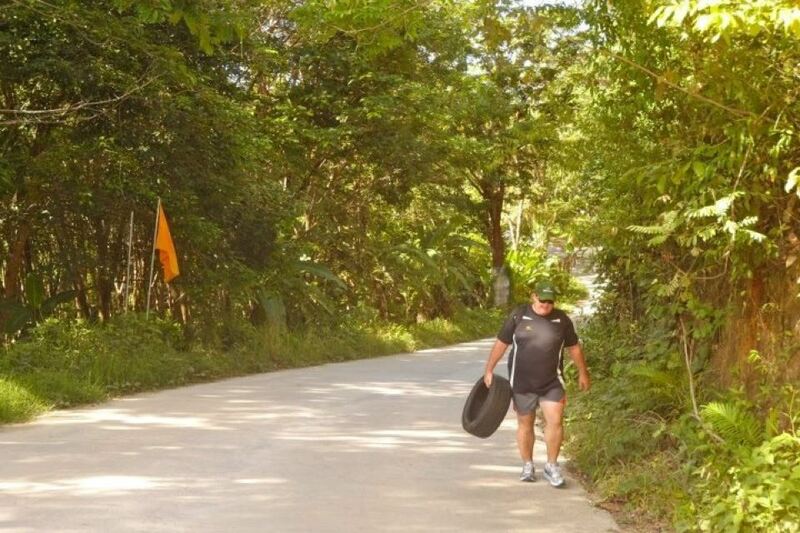 A larger than life character, Derek made the journey to Phuket in bid to change his weight, his diet and more importantly – his life. Derek is not alone. A 2009 study by the New Zealand Ministry of Health showed that one in three Kiwi adults were overweight (37.0%) and one in four were obese (27.8%). For him, it was a combination of alcohol and fast food that lead to his weight gain. It’s an all too common occupational hazard of the wheeler dealer lifestyle. Deals are made in and out of the office and that can often mean – the pub. A big fight fan, Jones was familiar with Tiger Muay Thai & MMA Phuket through Facebook. However, it was the success of Tiger’s own weight loss veteran, James Mason that got Derek’s mouth watering. With an appetite for change, Derek approached his boss with a proposal of coming to Tiger not only to improve his own health but also improve the business. It was a bold move but one that Derek feels employers can benefit from. Having contacted both James Mason and Tiger through Facebook, Derek realised that social networking sites have a lot to offer people in his situation. He sees Tiger’s Facebook page as a perfect first-step for making giant leaps in weight loss and also making contact with like minded people in similar circumstances. Through tracking his progress online, Derek knew that if James could do it – he could too. However he was aware that Thailand is not all sun, sea and squats. The country is world renowned for its parties and clubs. Avoiding these vices was one of his reasons for choosing Tiger Muay Thai & MMA Phuket over other facilities. James Mason knows all too well the enormity of Derek’s challenge. It’s challenge that he himself has faced at Tiger Muay Thai & MMA Phuket. Having arrived in 2010, fellow car dealer James has gone from 235 kg to an incredible 149 kg. Through a number of high profile media appearances and a successful blog, he has gone on to become a role model for weight loss all over the globe. James’ advice rings true with Derek. He knows that although the battle may be fought in Phuket, the war will take place when he returns back to New Zealand. Together with new mentor James, Derek is following a strict diet plan alongside a high-intensity strength programme devised by Tiger’s own nutrition and fitness guru, Peter ‘Thai Hulk’. Though tough at first, Derek knows that time is on his hands. After five weeks of training, he was able to conquer the weight room and lose a staggering 12 kg – well on track for his monthly 8 kg target. 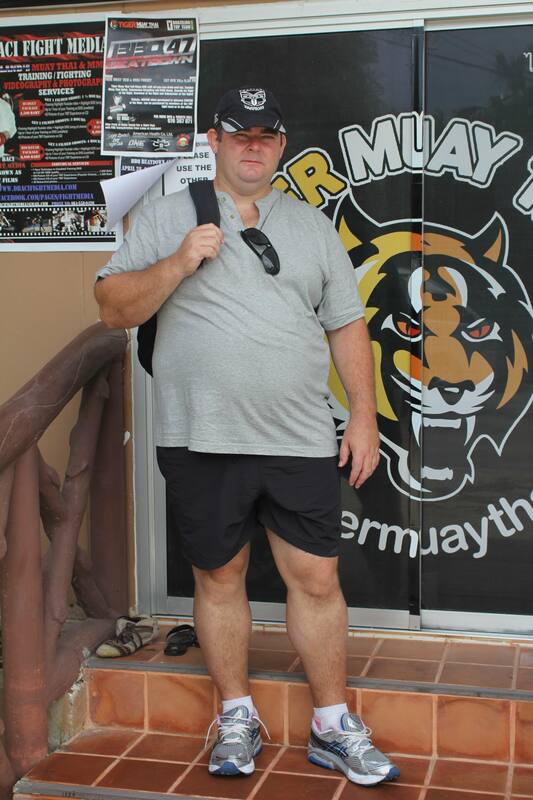 With his diet on the right track, Derek has now opened up his training regime to include many of the first class programmes on offer at Tiger Muay Thai & MMA Phuket. A keen stand-up fighter, he had his eye on the boxing class from the beginning. However, Derek knew he had to prepare himself mentally and physically before stepping back into the ring. Not content with the pressure of his trainers, Derek is keen to wow his colleagues and friends back home in New Zealand. He knows that through Facebook his progress is under the microscope and with a concerned boss to impress, he must raise his game. Derek is also expecting a two more of his biggest supporters to visit him in Thailand – his mother and brother. Brother, Murray also plans to train alongside Derek extra support and check-up on his progress. When his stint at Tiger comes to an end, Derek will continue his journey back home in Auckland. With the encouragement of his family, friends and colleagues, he knows that he can always rely on Tiger’s websites for that extra boost of energy.